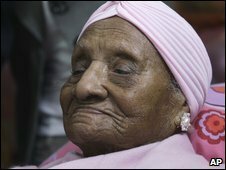 The oldest person in the world has died in Los Angeles at the age of 115 of suspected heart failure. Gertrude Baines, born 6 April 1894, had held the title since January, when a Portuguese woman, Maria de Jesus, died, also at the age of 115. Ms Baines's doctor said she had attributed her long life to a healthy lifestyle and her religious beliefs. The title of world's oldest person now passes to a 114-year-old Japanese woman, Kama Chinen. Officials at the Western Convalescent Hospital, where Ms Baines had lived for several years, said she had died at 0725 local time (1425GMT). "She told me that she owes her longevity to the Lord, that she never did drink, she never did smoke and she never did fool around," the AFP news agency quoted Dr Charles Witt as saying. He said two days before her death she had been "in excellent shape". "She was mentally alert. She smiled frequently," he said. Ms Baines, whose father was once a slave, was believed to be the oldest ever African-American voter when she cast her ballot for US President Barack Obama in November 2008. She said she was voting for him "because he's for the coloured people". She celebrated her 115th birthday in April and received a letter of congratulations from Mr Obama.